Step into a rich Victorian experience blended with 21st Century conveniences! 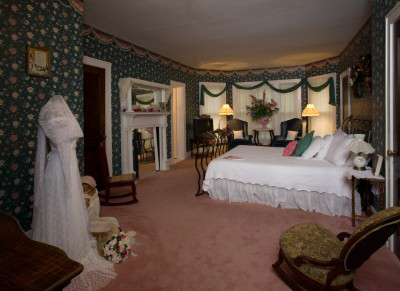 Mamie's Honeymoon Suite (named in honor of former First Lady Mamie Eisenhower) offers a unique king Comfort Zone® iron sleigh bed, a plush bay window sitting area, HD flat-screen television with VCR/DVD player and refrigerator, and a private bath with shower. The mirrors in the lovely white fireplace mantel opposite the bed reflect the subtle majesty of this suite.